Candy is a great treat, but some parents can be strict. 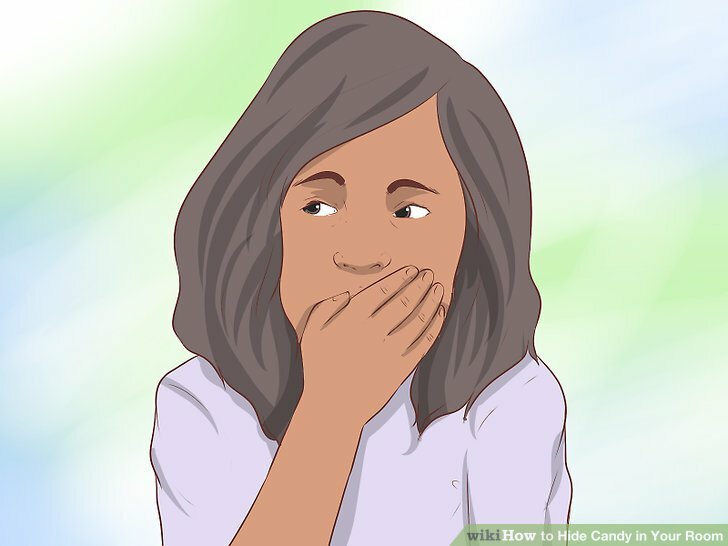 If your parents don't let you have candy (or if you have siblings who try to eat all your candy before you do), the best thing you can do is hide it. A good hiding place can keep your secret candy stash filled for weeks to come. A bad hiding spot can not only get you caught and in trouble, but it can get your candy taken away! Not every hiding spot will work for everyone, however, and how long you are able to keep your secret really depends in your hiding s****s, and your parents' finding s****s.
Hide your candy in layers. The longer it takes to get to your candy, the harder it will be to find. For example, your sock drawer may not be a good idea. All someone has to do is open up the drawer and see the candy. A better idea would be inside one of your socks. 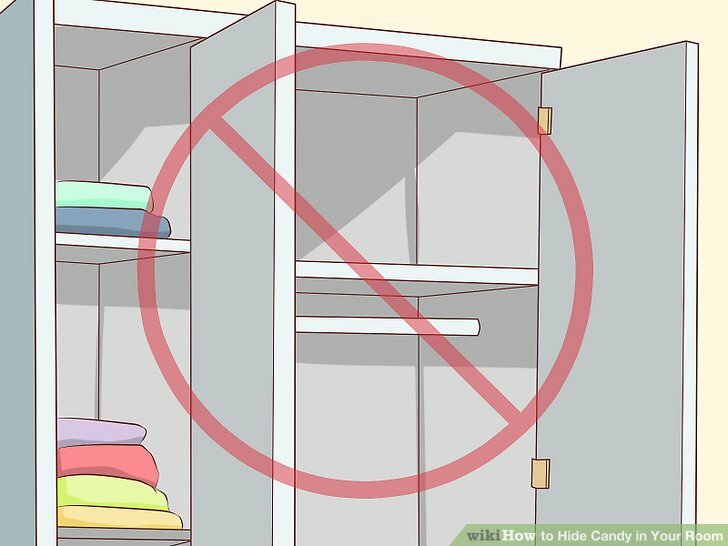 This way, whoever opens up your sock drawer won't be able to see your candy right away—they will have to dig through your socks first. Make your candy hard to get to. 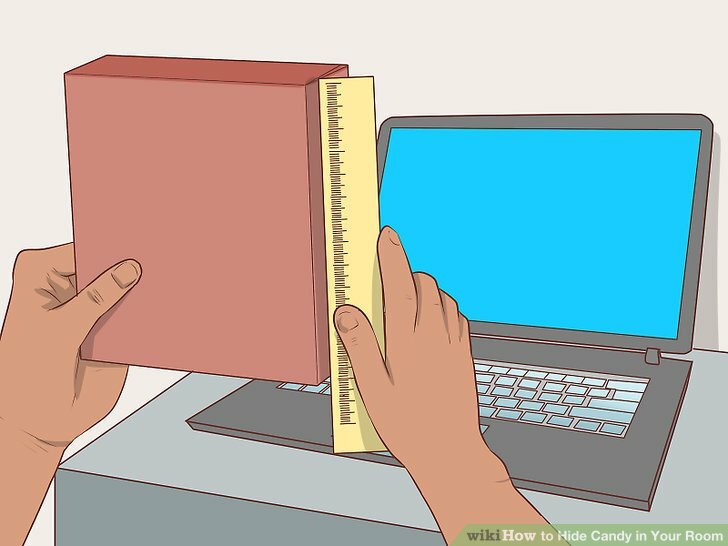 Similar to hiding your candy in layers, the longer it takes to get to your candy, the less likely someone will find it. Great places include under your clothes in a drawer, far under your bed, in a box at the very top of your shelf, and so forth. 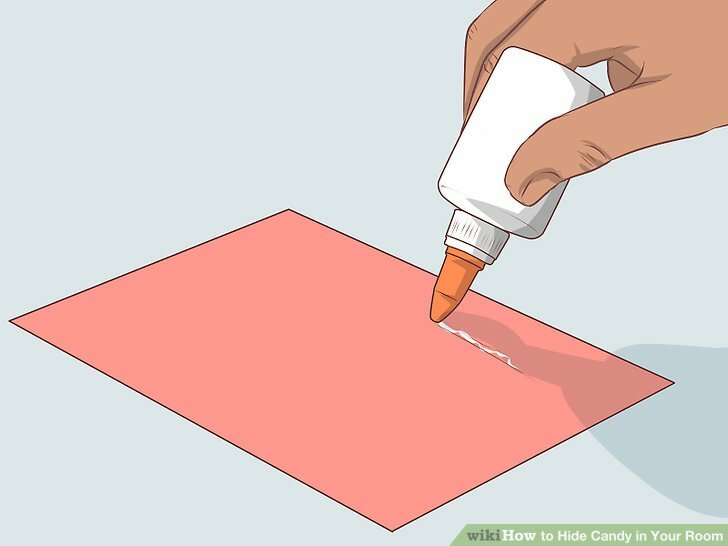 Hide your candy in different spots. The saying "don't put all of your eggs into one basket" exists for a reason. If you hide all of your candy in one spot, and someone finds it, you might end up with no candy. 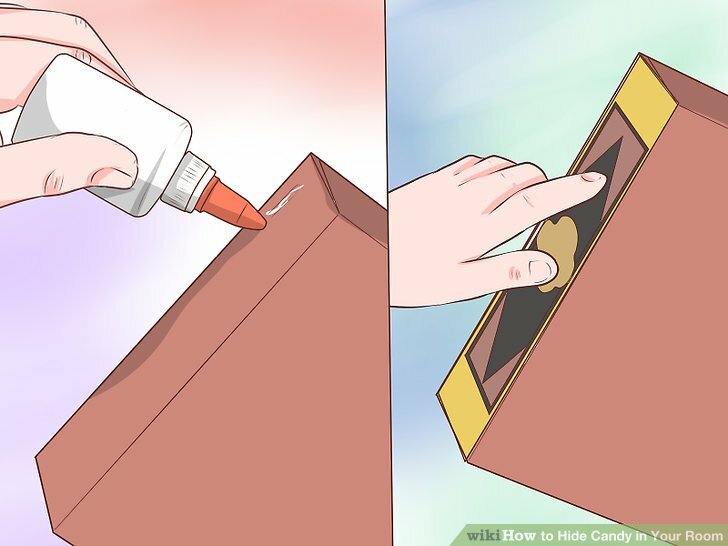 Try to hide your candy in at least two different places. Don't hide your candy too close together. 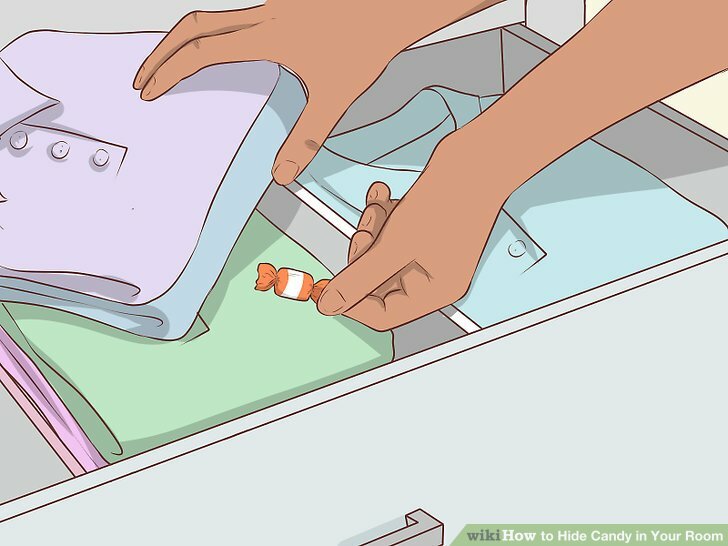 For example, if you have some candy tucked away into your socks in one drawer, don't hide the rest of your candy in the next drawer. Don't hide your candy in places that get warm. This includes next to windows, near heaters, or close to lights. The reason for this is simple: candy melts if it gets hot. A good hiding place won't be of much use to you if you can't eat the candy later on. Not to mention, melted candy can create a mess, and messes attract attention. Skip the obvious hiding places. Lockers, safes, and piggy banks are all popular hiding places—and this means that they are obvious hiding places. 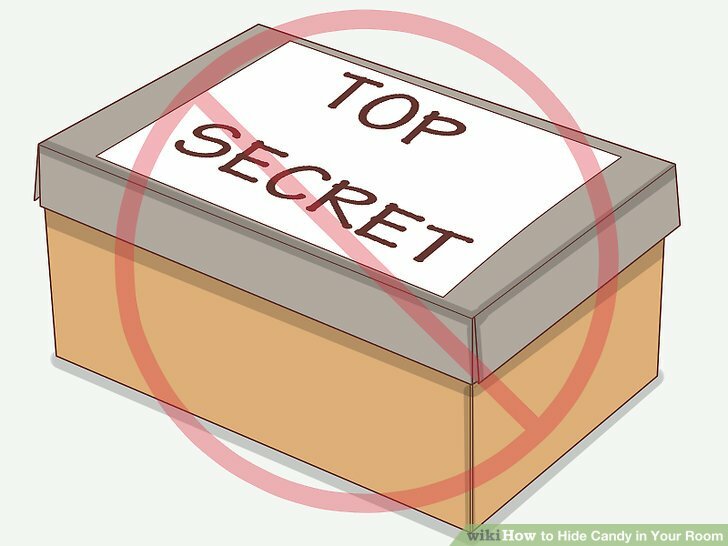 Shoe boxes that say "TOP SECRET" or "KEEP OUT" are also bad choices, because they draw attention and curiosity. Your friends and siblings would be more likely to go through these boxes. Try using what you have at home. You don't have to make a secret cubby to hide your candy. You can use what you have in your room, such as a sock drawer or tissue box. 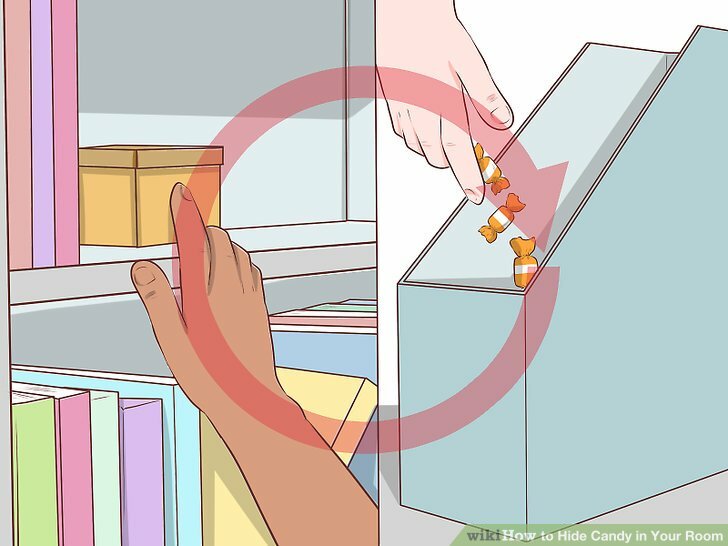 This section will give you a few ideas on where you can hide candy in your room. 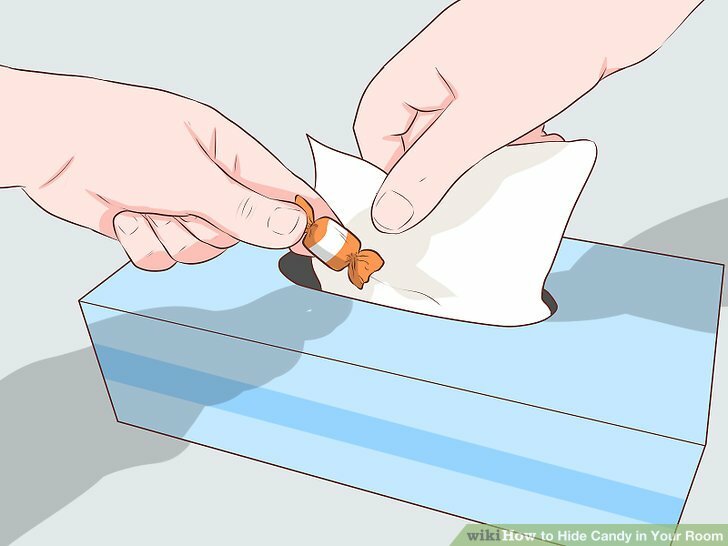 Hide your candy in the bottom of a tissue box. Find a tissue box, then carefully lift out the entire stack of tissues. 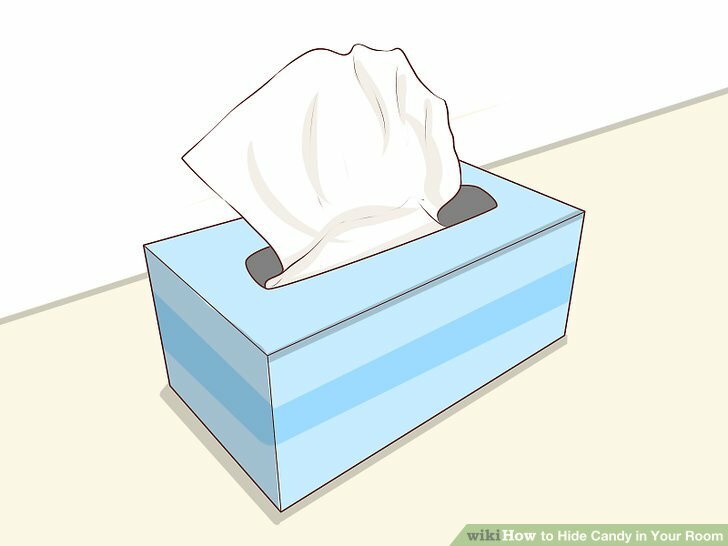 Place your candy in a thin layer along the bottom, then place the stack of tissues back. Pull out the first tissue—this will make it look like the tissues are "in use." Try hiding your candy inside your pillowcase. This only works for a short while, and you have to take the candy out before you go to sleep. 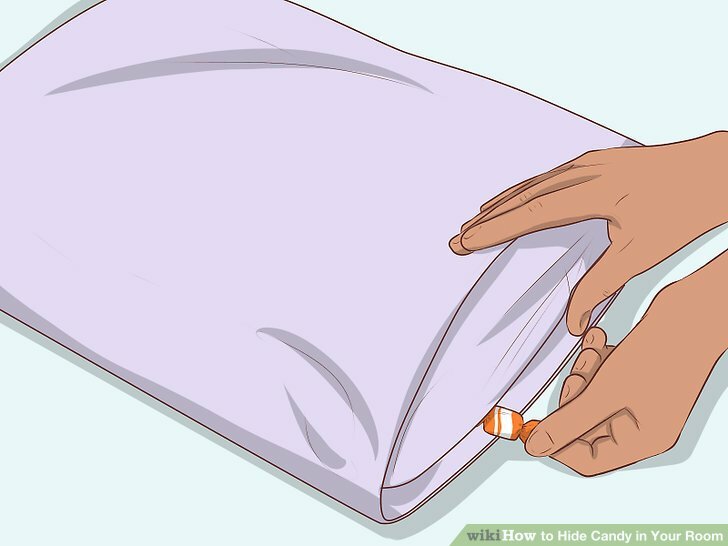 Keep the candy on the bottom of the pillow case—the side that is touching the mattress. If you put it in the top, the candy will make lumps, and give your secret away. 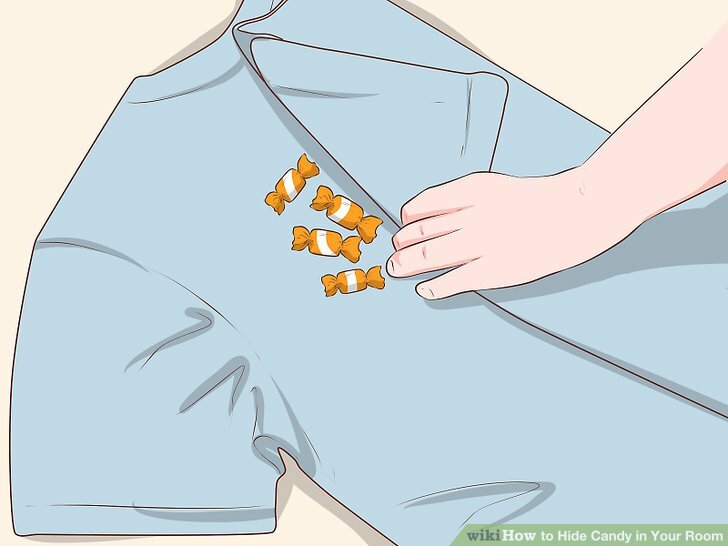 Hide candy inside your clothes. Find a shirt that you never use, and hide the candy in it. Place the shirt neatly back in your drawer. It would be best to use a shirt that you don't wear often. For example, if it is summer, hide your candy in a winter shirt or a sweater. If it is winter, hide the candy in one of your summer shirts. Another great hiding spot is inside of a pair of socks. Coat pockets make great hiding places too! 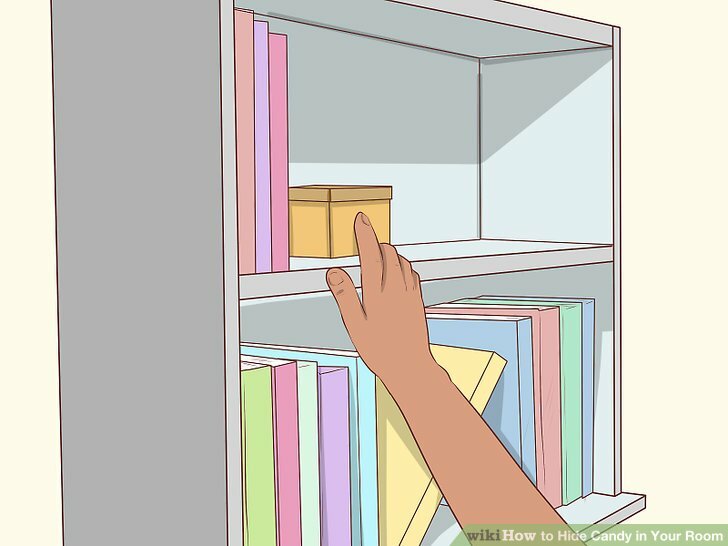 Keep the candy in a small box on top of your bookshelf. Push the box towards the back of the shelf, against the wall. This will keep the box out of sight. 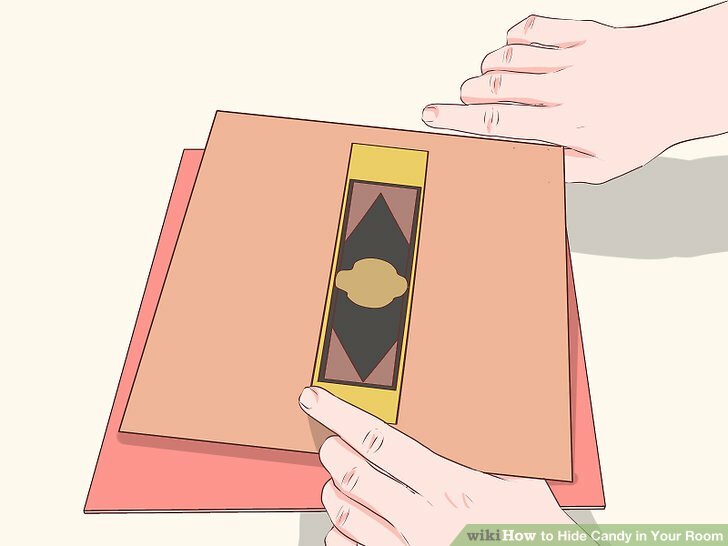 Hide candy inside magazine folders. It would be best to use folders that you are currently using. That way, the folders will look like they are only being used for magazines. Camouflage the candy. Candy and toys are both brightly-colored. 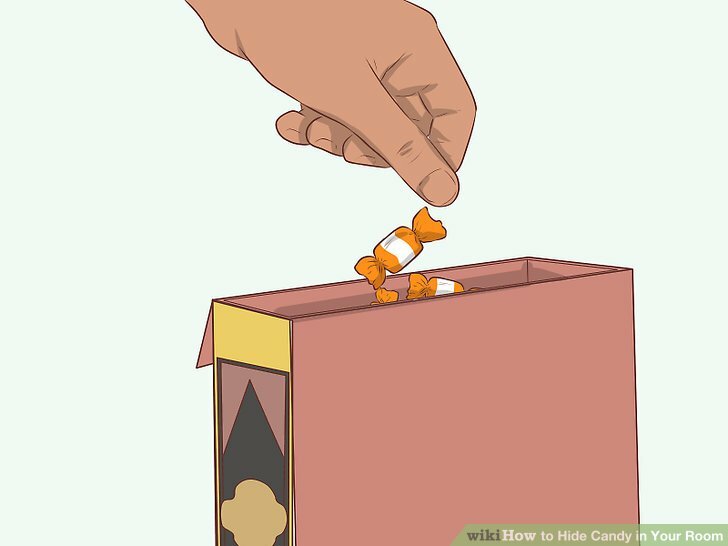 If you have a bin where you keep lots of small, plastic toys, you can hide some small, brightly-colored candies in the bottom of that bin. 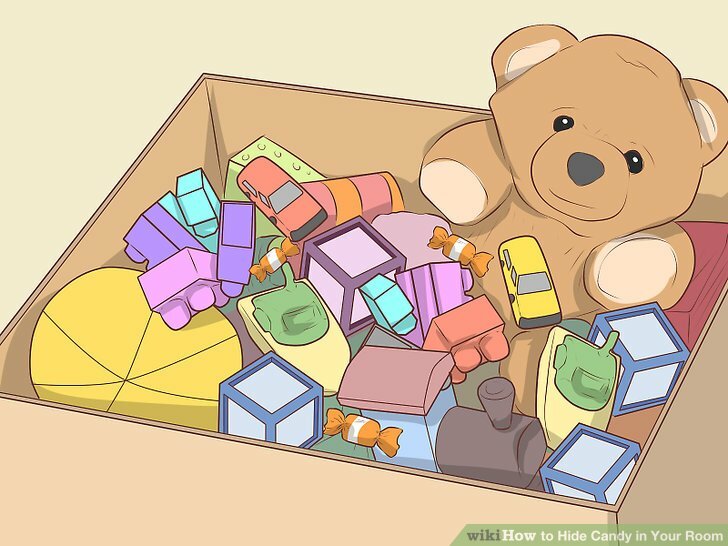 The bright colors of your toys will help camouflage the bright colors of the candy. Throw the wrappers away outside your home. If you have a trashcan in your room or home, don't throw the wrappers away in that. 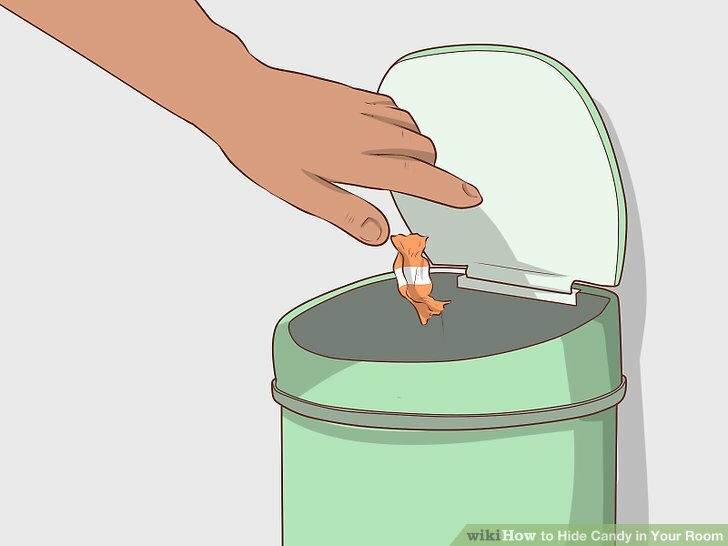 If someone sees candy wrappers in the trashcan, they will suspect that you are hiding candy in your room. Instead, throw the candy away at school. Don't brag. 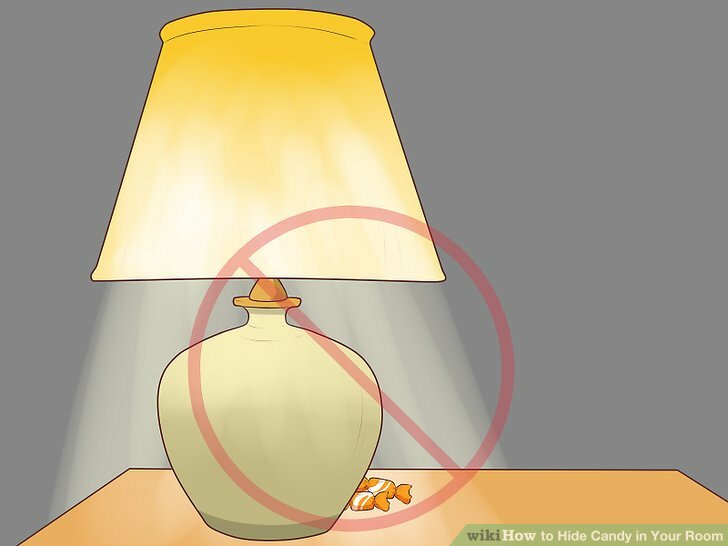 If you brag about hiding candy in your room, someone may go looking for it. If you have any siblings, it might be a good idea to keep your candy stash secret from them. If they get mad at you, they may tell on you. They may also get careless and accidentally give your secret away. Act natural. Don't get nervous, especially if someone is close to one of your hiding spots. For example, if someone opens the sock drawer where you hid your candy, don't scream "Don't open that!" or "Don't look in there!" This will tell the other person that you are hiding something, and they will get suspicious and look through your sock drawer. Don't draw attention to your candy stash. People tend to look where other people are looking. If someone is with you in your room, and you keep looking at your secret stash, the other person may get curious. They may even try to look wherever you are looking and find your candy. Don't hide your candy in places that other people go through often. For example, if someone does your laundry for you, don't hide your candy in your dresser, wardrobe, or closet. Another example would be a toy bin or a bookshelf that both you and a sibling use. Rotate your hiding places. The longer something sits in one place, the more likely someone will find it sooner or later. If you plan on hiding the candy in your room, plan on changing the hiding places at least once a week. If there are lots of people going through your room, you might even want to change the hiding places every day. Choose a box that will fit on your bookshelf. A shoe box might be a little too big, but those cardboard boxes that snacks and granola bars would be perfect. You can also use a small, wooden box instead. Find a picture online of some book spines. 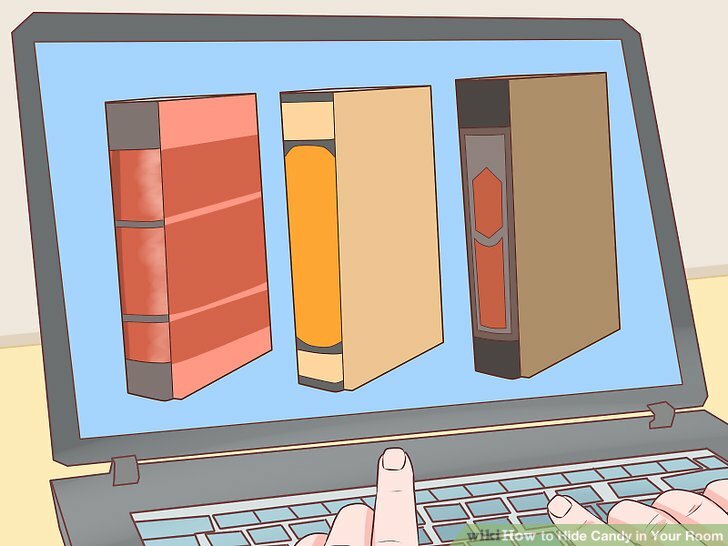 You can choose any types of books you want, but it might be a good idea to use books that you might find on your shelf. For example, if you have a lot of new books, a set of dusty, leather-bound books might look out of place. You can also stack some of your own books together, then photocopy their spines. Use an image editor to make them the same width as your box. Measure your box first and write that number down. Open up your picture in an image-editing program. Change the canvas size until the width matches up with the number you wrote down. Print the image out. Try to get good-quality print out. You can use plain, old printer paper for this. 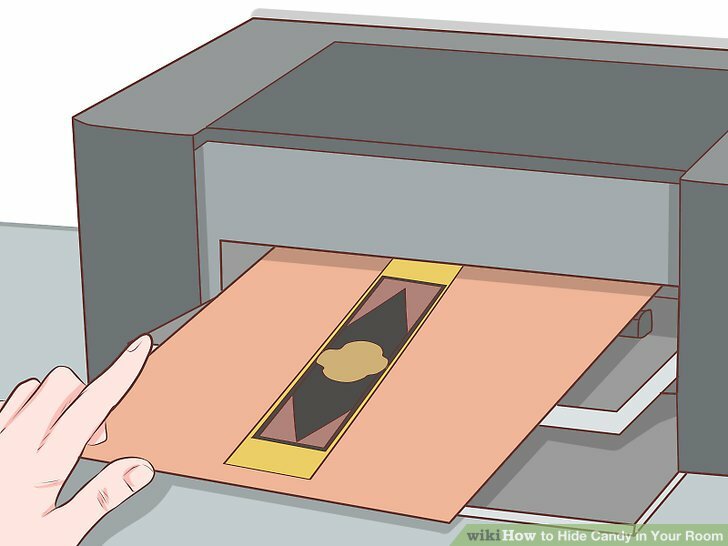 Glue the paper to a sheet of thin cardboard. Find a sheet of thin cardboard—an old cereal box would work great for this. Next, cover the cardboard with a thin layer of glue. It might be a good idea to paint the glue on with a paintbrush. If you use too much glue, your paper will get soggy. If you are using a cereal box, cut out the front or back first, then put the glue on the cardboard side. The image size will be on the back from now on. Place the picture on top of the glue. Use your fingers or the edge of a ruler to smooth it out. Wait for the glue to dry before you move on. Cut the spines out. The picture you printed out will probably have a white background, or the background of a bookshelf. For this project, you want just the spines and no background. Use a pair of scissors to cut your image out of the cardboard. Follow the top edges of the spines as best as your can. If you are very careful, you can also use a craft knife. Be sure to work on top of a cutting mat, and to cut away from yourself. Glue the cardboard to the side of your box. Cover the side of your box with a thin layer of glue first. Next, place the cardboard cutout on top of the glue. Make sure that bottom and side edges of your cardboard cutout match up with the bottom and side edges of your box. 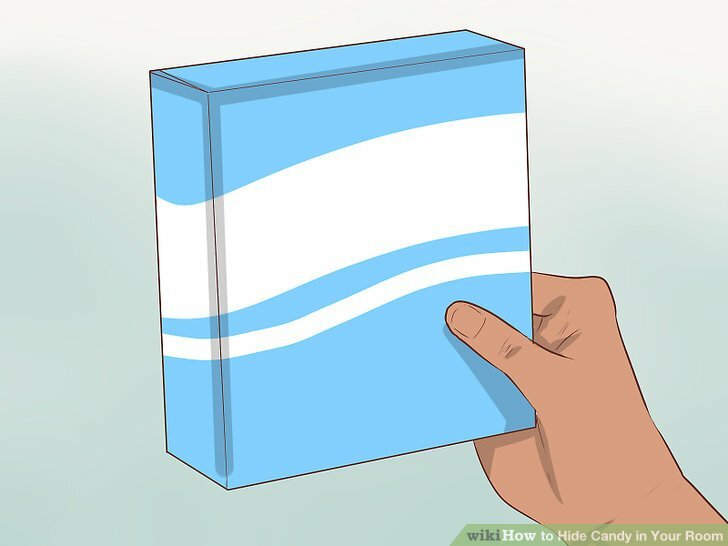 Fill your box with candy, then slide it between two books on your bookshelf. This cubby not only acts as a storage for your secret candy stash, but it also doubles-up as a nifty bookend! Don't limit your ideas to only candy. You can keep small bags of chips, cookies, or even fruit snacks! You can also use this on things that aren't edible, like love notes and cups of slime. Just be careful not to get any crumbs or stains on the carpet! If you have any younger/older siblings that may rat you out, the best thing to do is either bribe them, or stash everything into your schoolbag before your sibling tells your parent/guardian. 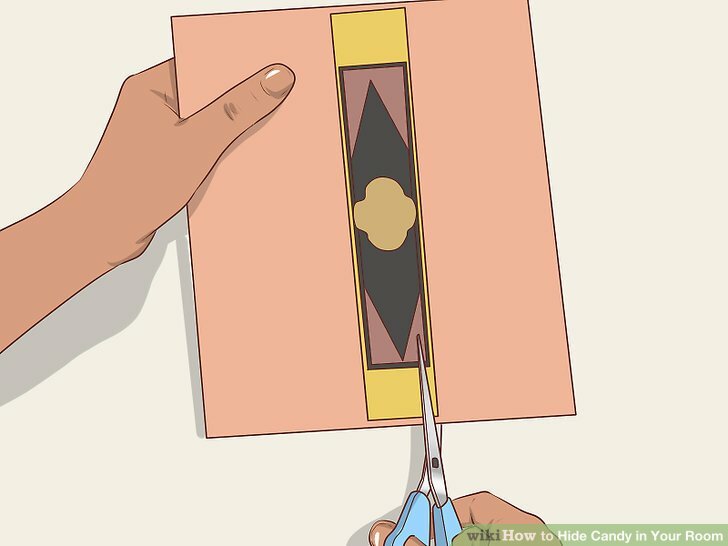 If you need to hide bulky candy, don't hide them in tight places. The bulges will give it away. 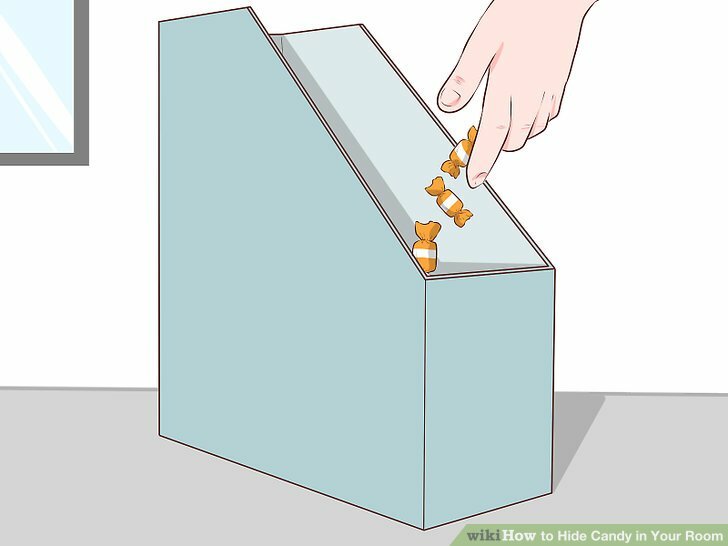 If you have a dog or any other kind of pet that could sniff it out, you should hide your candy up high. Keep your candy in the wrappers. This will not only keep your room clean, but it will also prevent ants and other critters. If you have an old bag that you don't use, hide your secret stash in there! 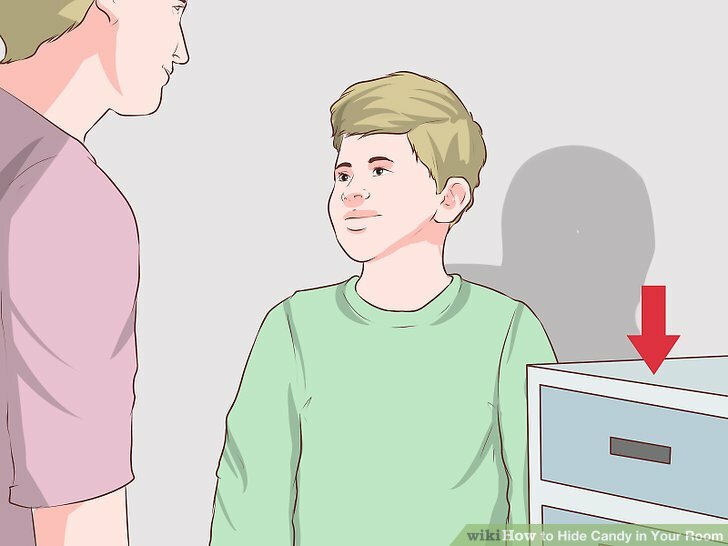 If you are eating when someone is coming to your room, hide the candy in a spot they wouldn't look at, but a spot that is close or they will be suspicious. For candy wrappers I just use a paper bag and then squish up the bag before throwing it away. I've done it a couple times and as long as nobody finds the bag, it should work. You can get paper bags from the dollar store. These methods are not guaranteed to work all the time. Whether or not someone finds your candy depends on how well you hid your candy—and how good they are at finding things. If your parents find out, the best thing you can do is give in and get in trouble. You can always start another collection later.